Untitled Document Below is a list of notable IDP free agent linebackers for 2012. This list will be continually updated throughout the off-season to reflect various changes in the free agency market. I will pull news from Rotoworld as it develops for each player and also add my own comments to these briefs. Is the lack of football during the off-season driving you crazy? Well look no further than this pharmacy in Canada to help sooth the stress. Now, onto the list of 2012 Notable Free Agent Linebackers. Pre Free Agent Period Analysis: Jackson racked up 158 total tackles in 2011 and re-established himself as one of the premier fantasy linebackers in the game. His injury history makes a long term deal seem improbable. However, he's open to the franchise tag which the Browns are likely to use on him. Either way, Jackson is very likely to be a Cleveland Brown next season. Fantasy Impact of Re-signing: Jackson will be back with the Browns in 2011 and should remain a top 3 LB pick in balanced and tackle-heavy IDP scoring systems. February 26 Update: According to the Cleveland Plain Dealer, free agent MLB D'Qwell Jackson had a "very positive meeting" with the Browns at the NFL Combine regarding a multi-year contract. Pre Free Agent Period Analysis: Lofton has led Atlanta in tackles each of the past three seasons and was fifth in the NFL this year with 147 total tackles. He will be a priority re-signing for the Falcons this off-season and figures to get a deal similar to the one Jets ILB David Harris received last August (4 years, $36 million). Fantasy Impact of Signing: Expect Lofton's fantasy value to diminish this coming season. The move to New Orleans will likely make for less tackle opportunity and the Saints recent signing of David Hawthorne will do nothing but further decrease that opportunity. Lofton is still a solid LB2+, just not the top 10 LB1 he was in previous years. March 18 Update: Free agent MLB Curtis Lofton will visit the Saints on Sunday. March 13 Update: FOX Sports' Alex Marvez reports the Bucs have cooled their pursuit of free agent MLB Curtis Lofton. March 1 Update: There are rumors floating around that the Falcons may let Lofton walk. He's looking for big money and there has been speculation that Atlanta's coaching staff doesn't completely trust him in pass coverage and they see have as more of a two down player. With this said, Tampa Bay has been rumored to be a potential landing spot for Lofton. February 26 Update: Speaking at the Combine, Falcons GM Thomas Dimitroff described contract talks with free agent MLB Curtis Lofton as "amicable." Pre Free Agent Period Analysis: It's pretty amazing that Fletcher had the best statistical year of his career at the age of 37. He put up an outstanding 167 total tackles last season and it looks likely that he will be returning to Washington for at least another year. Regardless of age, the combination of pure tackling ability, football IQ, and generous scorekeeping keeps Fletcher a top 20 linebacker moving into next season. Fantasy Impact: LFB is back with Washington. It's extremely unlikely that he puts up the numbers he did last season, especially with the emergence of Perry Riley on the strong side. However, he's still going to be one of the best LB2+ options in the game. February 26 Update: Redskins GM Bruce Allen confirmed during Super Bowl week that the team intends to re-sign free agent ILB London Fletcher. Pre Free Agent Period Analysis: It was a bit surprising that Tulloch was only able to land a one year deal last off-season. As a starter in Tennessee, he established himself as one of the more underrated MLBs in the game. His strong play certainly carried over to Detroit where he posted 84 solo tackles, 27 assists, and 3 sacks. The Lions are one of the fastest rising franchises in the NFL and I would expect the Lions to lock Tulloch up with a multi-year deal. Fantasy Impact of Re-signing: Tulloch will remain the every down MLB in the Motor City and should produce LB2 numbers again in 2012. March 13 Update: Free agent MLB Stephen Tulloch plans to test the open market. February 26 Update: The Philadelphia Inquirer expects the Eagles to fill their middle linebacker need in free agency rather than the draft. The Inquirer suggests Stephen Tulloch, who has played behind Wide-9 schemes his entire career. The Eagles run the same system. "How [the Eagles] didn't get this guy last year is beyond me," said one NFL scout of Tulloch. "They may have to pay this time." Pre Free Agent Period Analysis: Hawthorne remains one of the more underrated linebackers in the league. His tackle numbers suffered a bit in 2011 due to a knee injury which limited him for a major portion of the season. Hawthorne's health improved towards the end of the season and as a result he managed to finish within the top 15-20 in most scoring systems. The Seahawks don't seem super anxious to re-sign the undrafted free agent out of TCU, so he may very well find himself playing for another team next season. Fantasy Impact of Signing: Hawthorne's departure from Seattle is going to hurt his fantasy numbers. He will likely play on the weak side in New Orleans where he will struggle to put up anything more than LB3 numbers amongst their crowed and vastly improved linebacking crew. March 15 Update: Free agent LB David Hawthorne will visit the Saints Friday. February 26 Update: The Seahawks are reportedly unwilling to "break the bank" on free agent MLB David Hawthorne due to durability concerns.The Seattle Times also indicated after the season that the Seahawks wanted more speed at inside linebacker. Hawthorne can stuff the run with the best of them, but doesn't run particularly well. The Seahawks are expected to place a higher priority on re-signing free agents Marshawn Lynch and DE Red Bryant. Pre Free Agent Period Analysis: Levy was the Lions most disciplined linebacker last year (only two penalties) and played well within the scheme. He, along with Stephen Tulloch, helped solidify the Lions' linebacking crew and help raise the overall quality of their defense. Look for Levy to stay in Detroit as not many teams will be willing to shell out the compensation necessary to secure him as a RFA. Fantasy Impact of Re-signing: From a box score production standpoint, Levy was up and down throughout the course of the 2011-2012 season. With Stephen Tulloch and Justin Durant snatching up a lot of tackles, Durant's production can waver quite dramatically from game to game depending on the opposing offenses strategy. He shouldn't be trusted as anything more than a low-end LB3/LB4 matchup play. Pre Free Agent Period Analysis: Ruud was a disappointment in Tennessee to say the least. He was vastly outplayed by rookies Akeem Ayers and Colin McCarthy. Ruud's under performance can partly be chalked up to a shoulder injury he sustained midway through the season, however there were signs that the wheels for falling off before that. Ruud didn't generate a ton of interest last season from teams and it's hard to imagine any team that is willing to give him a long-term deal. Maybe he'll get lucky however and land short term in an ideal fantasy situation. We'll just have to wait and see. Fantasy Impact of Signing: Ruud's on the field play has diminished greatly over the last couple of seasons and this will make the 2nd season in a row that he was only signed to a one year, tester deal. He was likely brought in to give the Seahawks a more veteran presence among a fairly youthful linebacking crew. There's always a chance he could emerge as the starting MLB (more likely due to injury than skill) and is worth keeping on your radar as a potential waiver wire pickup. Pre Free Agent Period Analysis: Connor filled in decently for the injured Jon Beason last season and has said that he wants to test the open market. Connor is an above average run defender with little wear on his body. With this said, chances are good that he lands a starting job somewhere. However, unless he improves his coverage skills, he's likely to remain a two down linebacker and LB4 matchup type play. Fantasy Impact o f Signing: Connor will be a two down, run-thumping linebacker with Dallas. Much like last season with Carolina, there will be games (primarily against run-dominant teams) where he will produce high level tackle numbers. However, the majority of his games he will fall into the LB4 category. March 13 Update: Profootballtalk reports free agent ILB Dan Connor will visit the Cowboys. March 1 Update: Yahoo's Jason Cole reports that the Cowboys have interest in free agent ILB Dan Connor. Connor is a rock-solid player and could fit Dallas' 3-4 scheme nicely at inside 'backer, but it would be surprising if the Cowboys paid him big money with Bruce Carter ready to start next to Sean Lee. February 26 Update: The Charlotte Observer expects the Panthers to let free agent MLB Dan Connor walk on the open market.The Panthers can't promise a starting job with Jon Beason returning, and Connor has earned a long-term deal with high-quality run defense over the past two seasons. Connor, 26, should appeal to both 3-4 and 4-3 teams. He's one of the top players available in a loaded free-agent inside linebacker class, along with Curtis Lofton, David Hawthorne, D'Qwell Jackson, and Stephen Tulloch. 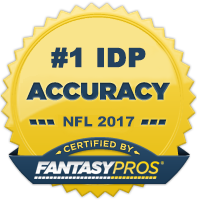 Pre Free Agent Period Analysis: Henderson was an IDP darling of many fantasy owners a few years back. However, age and injury have taken their toll on E.J. 2011 was the first season in several seasons that Henderson was not playing on all passing downs. Rumors are swirling in Minnesota that Henderson only remains a "backup plan" for the Vikings. I would expect the rebuilding Vikings to go younger at the position. Fantasy Impact: The Vikings don't seem super interested in bringing the elder Henderson back into the fold. If they do, he will likely only be a two-down player. This is probably the case no matter which team he lands on which spells trouble for his overall fantasy value. With this said, owners should be drafting Henderson as an LB4 at this point. February 26 Update: The St. Paul Pioneer Press reports the Vikings are not planning to use the franchise tag.Led by MLB E.J. Henderson and TE Visanthe Shiancoe, the Vikings have an unimpressive group of in-house free agents. ESPN 1500 Twin Cities reported in November that Henderson would be a "backup plan at best" this off-season. Shiancoe is expected to walk. Pre Free Agent Period Analysis: Belcher held up very well against the run last season and was second on the team in tackles next to stud WILB Derrick Johnson. Johnson himself attributed a major portion of his success over the past two years to playing next to "thumper" Belcher. If he were an UFA, Belcher would have some suitors on the open market, but being a RFA hinders his appeal to other teams. Belcher will likely remain in Kansas City for the time being and since he's a major liability in coverage, he's likely to remain a two down linebacker. Fantasy Impact of Re-signing: Belcher is in a similar boat to Dan Connor: excellent run defender who struggles in coverage and whose fantasy value will therefore be limited to LB4+ status. Pre Free Agent Period Analysis: Hill was finally able to stay healthy for an entire season and it showed as he had one of his best seasons to date. His performance did start to tail off during the last third of the season, however. Both Hill and teammate David Hawthorne are toss-ups to be re-signed by the Seahawks. Judging by past experiences with linebackers such as Aaron Curry and Lofa Tatupu, the Seahawks will probably let at least one of them walk especially with an emerging K.J. Wright waiting in the wings. Hill should draw some interest around the league as he is a solid all around player with a decent amount of playing experience. Fantasy Impact: During the 1st half of the season, Hill was a solid LB3 matchup play. Look for that to continue heading into the 2012 season as the Seahawks will turn to him for veteran leadership amongst a young group of core linebackers. March 1 Update: The Seattle Times believes free agent WLB Leroy Hill's latest arrest has ended his Seahawks career.Hill's Saturday arrest for marijuana possession was his third arrest in four years. Limited to one game by an Achilles injury in 2010, Hill bounced back to notch 89 tackles and four sacks last season, but simply isn't worth the headache heading into his age-30 campaign. He'll likely draw little interest on the open market before the beginning of training camp. Pre Free Agent Period Analysis: Erin, the younger brother of E.J. Henderson, showed glimpses of full-time LB potential at times during the regular season. However, he showed poor gap discipline and didn't play that well against the pass as the team's nickel MLB. If the Vikings continue to look at him as a part time player (played in 53.8% of the team's snaps), he will likely land somewhere else in free agency. Fantasy Impact of Re-signing: I'm very surprised that Henderson didn't draw more interest on the open market. He's only 26 and showed great run stopping ability last season. With older brother E.J. likely gone, Erin could very well become a three down linebacker and remains a high risk, high reward late round option at LB. March 18 Update: Free agent WLB Erin Henderson says the Vikings have yet to make him an offer. March 6 Update: The Vikings are discussing a two- or three-year contract with free agent WLB Erin Henderson. Minnesota is seriously interested in retaining Henderson to book end SLB Chad Greenway. The Vikings also need a new middle linebacker, although Jasper Brinkley is an in-house option. Henderson, just a one-year starter and two-down defender last season, shouldn't command more than $3-4 million per year. February 26 Update: The player rep for free agent WLB Erin Henderson plans to have contract talks with the Vikings at next week's Combine.Henderson has "made it clear" he wants to stay in Minnesota, and it's believed the Vikings could retain him at an affordable rate. Henderson, 25, graded out as an elite run-defending linebacker in 2011, per Pro Football Focus. He finished his first season as a starter with 70 tackles and two forced fumbles. Are there any other 2012 Free Agent Linebackers that you think should be included in this conversation? If so, please let me know by posting a comment below or emailing me at theidpguru@idpguru.com. You can also hit me up on Twitter.